Place Royale and Plains of Abraham are good opportunities to explore the local culture. Explore hidden gems such as Sanctuaire de Sainte-Anne-de-Beaupré and Notre-Dame de Québec Basilica-Cathedral. There's lots more to do: appreciate the extensive heritage of Old Quebec, contemplate the long history of Morrin Centre, admire the majestic nature at Montmorency Falls Park (Parc de la Chute-Montmorency), and take a stroll through Lower Town (Basse-Ville). To see more things to do, ratings, traveler tips, and other tourist information, you can read our Quebec City travel itinerary planner. Philadelphia, USA to Quebec City is an approximately 5.5-hour flight. You can also drive. Traveling from Philadelphia in September, things will get little chillier in Quebec City: highs are around 69°F and lows about 52°F. Finish up your sightseeing early on the 19th (Tue) so you can go by car to Montreal. Kick off your visit on the 19th (Tue): admire the masterpieces at The Montreal Museum of Fine Arts and then take in the spiritual surroundings of Saint Joseph's Oratory of Mount Royal. To see reviews, maps, where to stay, and other tourist information, you can read our Montreal custom trip planner. You can drive from Quebec City to Montreal in 3 hours. Alternatively, you can take a bus; or take a train. In September, daytime highs in Montreal are 71°F, while nighttime lows are 56°F. 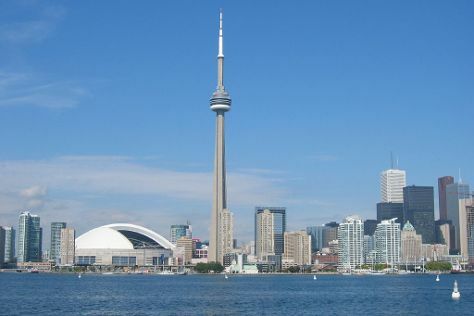 Wrap up your sightseeing on the 20th (Wed) to allow time to travel to Toronto. Kick off your visit on the 21st (Thu): examine the collection at Hockey Hall of Fame, appreciate the extensive heritage of The Distillery District, and then enjoy breathtaking views from CN Tower. Get ready for a full day of sightseeing on the next day: see the interesting displays at Royal Ontario Museum and then step into the grandiose world of Casa Loma. To see maps, traveler tips, photos, and other tourist information, go to the Toronto tour planner. Fly from Montreal to Toronto in 3 hours. Alternatively, you can take a train; or drive. In September, daily temperatures in Toronto can reach 71°F, while at night they dip to 57°F. Wrap up your sightseeing on the 23rd (Sat) early enough to drive to Niagara Falls. Kick off your visit on the 23rd (Sat): do a tasting at Konzelmann Estate Winery, then identify plant and animal life at Niagara Parks Butterfly Conservatory, and then take in the dramatic natural features at Journey Behind the Falls. On the 24th (Sun), you'll have a packed day of sightseeing: tour the pleasant surroundings at White Water Walk and then take in the dramatic scenery at Niagara Falls. To see maps, traveler tips, other places to visit, and other tourist information, read our Niagara Falls travel itinerary creator. Drive from Toronto to Niagara Falls in 1.5 hours. Alternatively, you can take a bus. In September, daily temperatures in Niagara Falls can reach 73°F, while at night they dip to 53°F. Cap off your sightseeing on the 24th (Sun) early enough to travel back home.